Home \ Tag "scholarship award"
A student of Godfrey Okoye University Enugu, Onah, Jude Onyeka, who produced a prototype car has won a scholarship to study Aeronautics Engineering in China. 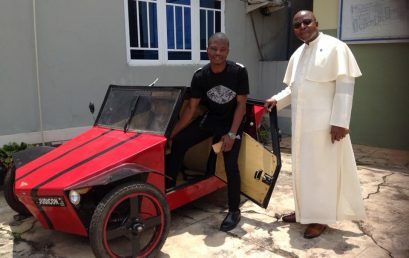 Here Onah, Jude presents the car and his travel documents to the Vice Chancellor of the university, Rev. Fr. Prof. Christian Anieke. GO University received its operational licence from the National Universities Commission (NUC) in 2009, and so commenced full academic activities in the 2009/2010. All our programmes have NUC accreditation. GO University’s law faculty also has the approval of the Legal Council of Education. GO University also runs postgraduate programmes in Education, Management and Social Sciences, Natural and Applied Sciences. We have produced graduates who were all successfully mobilized for the National Youth Service Corps (NYSC) scheme in their year of graduation. Godfrey Okoye University partners with the ICPMD, EU and Private Investors to establish Institute of Practical Skills and Start-up Centre. © 2019 GODFREY OKOYE UNIVERSITY, ENUGU- Powered by GOUNI ICT. All rights reserved.